For most of us, blogging is a part time hobby that we fit in around our usual full time commitments; whether it's working, studying, raising a family or a mixture of them all. For me it's mainly working - I work Monday to Friday 9-5pm (what a way to make a living...) and blog around this. To be honest it isn't easy, but I do it because blogging is my love and passion and for me, it's worth it. Over the last 3 years I've evolved and developed the way I manage my blogging time, which I'm sharing today - hopefully you will find it helpful if you're struggling with the same sort of situation. 1. Set an achieveable posting target. Review how much free time you have on a daily/weekly/monthly basis and realistically how much of this free time you can dedicate to blogging. Post within your limits, whether this is twice a week or five times a week, not forgetting that posting encompasses writing, photography, editing, promoting on social media, replying to comments and possibly liaising with PRs. My achievable posting target is set at three times a week at the moment, I potentially could do four but instead I use that portion of time for other "blogmin", catching up on my Bloglovin feed and general social media interaction. 2. Take advantage of any dead time. It's only been in the last year since changing jobs and having a slightly longer lunch break, that I've started doing blogging tasks in that 40 minute period where I'd normally read a magazine or scroll through my Facebook feed. I can often draft up a post in that time using the Blogger app and then add photos, links etc when I get home, or I reply to emails and blog comments. It makes such a difference! Other dead time to take advantage of could be commuting or while you're out waiting for a friend or for the kids to come out of school; even 5 minutes could give you time to schedule tweets for your latest post. Although this might seem a bitty way of getting things done, it isn't always possible to set aside large blocks of time to blog, so I'd rather do it this way than not at all. 3. Make use of apps. A significant portion of my blogging is done on my iPhone and apps make this a LOT easier, especially when I'm out and about. I have a special dedicated app section, simply called "Blog", so they're all in one place. When drafting posts on my lunch break I use the Blogger app; although it doesn't have nowhere near as much functionality or flexibility compared to the full version, it's good for getting your words down and doesn't need the internet to work. I also have apps for Twitter, Pinterest, Instagram, Repost & Regram, Bloglovin, Buffer (for scheduling tweets) and Google Analytics, all of which I believe are free. Google Analytics by the way is so much easier to use and understand on the app - get it if you haven't already. Nothing new here and almost obvious, but planning and scheduling really takes the pressure off blogging on a day to day basis. Yes you do specifically have to set aside some time for this on a weekly and/or monthly basis, but it won't take hours and could probably be done while watching Eastenders. My biggest tips would be to make sure you have a backup list of blog ideas for uninspired days, use a monthly blog planner so you know when posts need to be written up by (like the one I use here for example) and schedule in your posts and tweets. Scheduling is a god send when you're working full time - if I didn't take advantage of it I would simply forget as I usually have too much else on my mind. My aim is to publish my blog posts at 6.30pm GMT and there's been so many times I've forgotten to or posted late, because I've been in the middle of cooking or I'm rushing around getting ready to go out. 5. If it's all getting too much, take some time out. When blogging is your hobby and you're not dependent on it to live, do not feel any pressure to keep going with it if it's all getting too much. Take a step back, have a few days off, even a few weeks if you want to. It will still be there when you come back and your readers will understand, especially if they're bloggers, because they've probably been there and done that too. I certainly have! Every time it's been exactly what I needed and I come back refreshed, refocused and re-inspired. Finally, the most important lesson I've learnt over the last 3 years is that you must do what works for you to get the job done. Period. 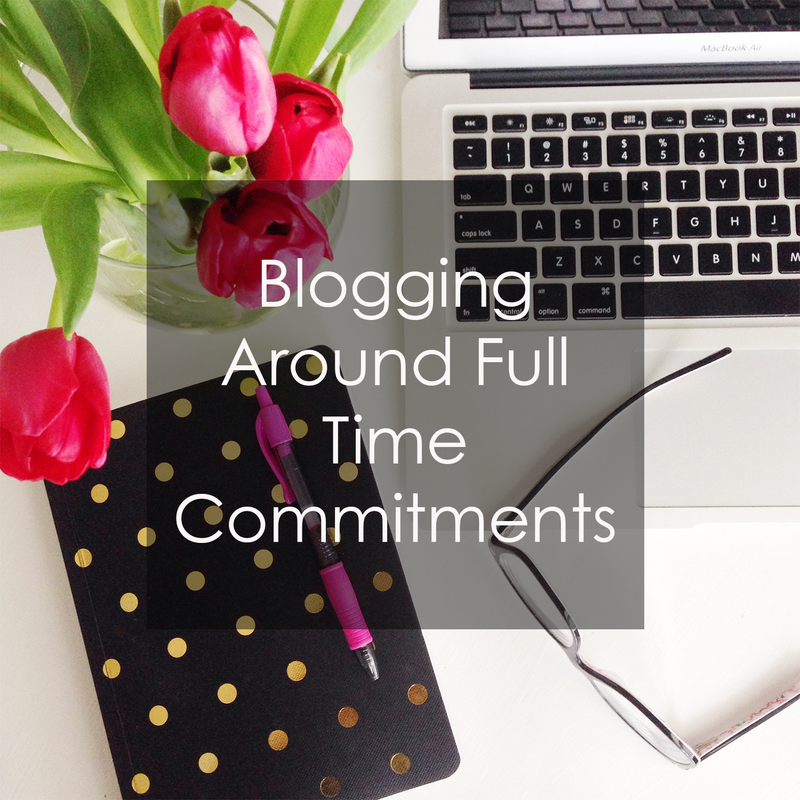 What are your tips for blogging around full time commitments? so true. i always find having a little schedule very helpful. except now with holidays around, I can't find some time to blog as I'd love to. and definitely take some time off when in need. Because blogging is seriously a 24/7 h job. These tips are really useful, I still find it hard to find time for blogging :( I think I just need to be more organised! So many helpful tips, I have to do all my blogging at the weekend but I do the occasional update in the week after work! I wish I could master the art of blogging from a phone haha. Great advice! I do a lot of blog stuff when I'm waiting for my kids in the car at athletics training! These are great tips! Im going to have to give Buffer a try! These are great, and some of them I even had to remind myself about. Such as the taking time out. Family comes first, and when I feel snowed under with the blog, I take time away to refocus and refresh. Such a useful post! You're right about how difficult it can be keeping up with a blog and full time commitments too. It's something I'm determined to be better at though and you've provided some great tips for it. Brilliant tips! I took a break during my exams throughout May and June and it really helped me prioritise what was more important at the time. Blogging can be very time consuming but it's worth it when you find the time! I really enjoyed this post! I love that word 'blogmin' haha!